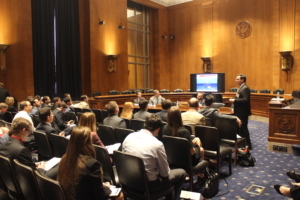 On 20 September, IADC hosted an “IADC Offshore Drilling 101” Lunch and Learn in Washington, D.C. to educate Capital Hill staffers on the basics of offshore drilling operations, along with the positive impacts of drilling operations on the U.S. economy. IADC offshore members who led the Lunch and Learn presentation also visited with several Senators, Members of Congress and their staff while in D.C. to educate them about the offshore drilling industry, it’s goals and successes and to give them a better sense of who IADC’s members are, and what they do. Brady Long, Senior Vice President and General Counsel, Transocean Ltd.
James Sanislow, Vice President and Chief Compliance Officer, Noble Drilling Services, Inc.
Tony Seeliger, Pacific Drilling, presents “Offshore Drilling 101” to Capital Hill staffers during IADC Lunch and Learn event. 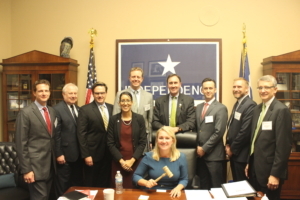 IADC members and staff meet with Congressman Pete Olson of Texas. Pictured from left to right: Mike Lawson, Rowan Companies; Alan Spackman, IADC; Tony Seeliger, Pacific Drilling; Melissa Mejias, IADC; Brady Long, Transocean Ltd.; Congressman Pete Olson of Texas, Jason McFarland, IADC; Steven Schappell, Maersk Drilling USA; James Sanislow, Noble Drilling Services, Inc.
On 19 October, IADC will air a free video webcast, sponsored by The REACH Group, that will feature a discussion exploring key tools to effectively develop tomorrow’s leaders, based on real-world examples in the drilling industry. Two highly respected drilling CEO’s, along with an expert in leadership development, will discuss how contractors are expected to manage their business effectively with leaders who know how to deliver safe, efficient operations. When the market returns, it will remain extremely competitive, and leaders will need to make the right decisions the first time as there will be little patience for error. The webcast panelists will explore these realities and more. To register for the free webcast, please visit IADC’s website. Those who register will receive a login email on the morning of 19 October to access the Virtual Panel Discussion webcast. On Friday, 23 September, the Oil and Natural Gas Subsector Coordinating Council (ONG-SCC) hosted a 2-hour educational session for the U.S. Department of Energy and other agency staff who are involved in or interested in how the oil and natural gas industry works and how it prepares for and responds to weather-related events. The session included a brief overview of how the industry works – from production to distribution – and addressed how various elements of the operations across the oil and natural gas supply chain prepare for response. Presenters highlighted potential challenges, the ways in which industry and government can work together to limit impacts to the public, and the differences between oil and natural gas when weather events impact operations. The educational meeting was particularly timely in light of NOAA’s increased prediction for the potential number of named storms in the 2016 hurricane season, as industry, along with Federal, state and local government agencies, consider what is needed to ensure impacts are understood and can be responded to efficiently and effectively. Industry representatives from all aspects of the oil and natural gas supply chain were present and available for questions during and after the session presentations. Melissa Mejias, IADC Legislative Analyst, presented on behalf of IADC. The ONG-SCC will host another DOE educational session, “Understanding the Oil and Natural Gas Industry: Regulatory Framework” at a to be decided date later this year. For more information about the ONG-SCC please visit the website. And for information about upcoming meetings, please contact Melissa Mejias at Melissa.mejias@iadc.org. The National Academies of Sciences, Engineering, and Medicine will host a workshop on 12 October in Houston to discuss the Strengthening the Safety Culture of the Offshore Oil and Gas Industry report. To engage BSEE and the members of the offshore oil and gas industry in a discussion about the recommendations contained in the report in order to help identify concrete steps for going forward. To provide the offshore industry with guidance on how to get started or how to continue their efforts for strengthening safety culture. The free workshop is scheduled from 8:30 a.m. to 1 p.m., and lunch will be provided. Those who wish to attend must register in advance. To read the Strengthening the Safety Culture of the Offshore Oil and Gas Industry report, please visit The National Academies Press website. On 30 December 2015, one person was killed and four injured on the drilling rig COSL Innovator as a result of a breaking wave in the Norwegian part of the North Sea. The breaking wave also caused damage to the rig’s accommodation area in the deck box. Before the incident occurred, COSL Innovator was disconnected from the well as a result of bad weather and was raised to its survival condition. At the time of the incident, COSL Innovator’s superstructure was not dimensioned to resist horizontal wave loads, even though the unit did not have a positive air gap (gap between the underside of the lowest deck and the highest wave crest). The incident has led the North Sea Offshore Authority Forum to issue a safety alert highlighting the fact that the superstructure should be dimensioned to resist not only vertical but also horizontal wave loads in the case of negative air gap. Please visit the Petroleum Safety Authority’s website for the full investigation report. The Pennsylvania Department of Environmental Protection is expected to finalize its Environmental Protection Performance Standards at Oil and Gas Well Sites rulemaking this fall, after a 5-year development process. The rulemaking represents the first update to rules governing surface activities associated with the development of unconventional wells. The amendments applicable to conventional oil and gas wells were withdrawn at the direction of the Office of Attorney General in response to the passage of Act 52 of 2016. The new regulations will address surface activities at unconventional well sites, and center on five core areas. The amendments improve protection of water resources; add public resources considerations; protect public health and safety; address landowner concerns; and enhance transparency and improve data management. For more information, please visit the Pennsylvania Department of Environmental Protection website. The Railroad Commission of Texas (RRC) recently issued statistics on drilling permits and completions for the month of August, 2016. The RRC issued a total of 660 original drilling permits in the month of August, compared to 864 in August of 2015. The August total included 512 permits to drill new oil or gas wells, eight to re-enter plugged well bores and 140 for re-completions of existing well bores. The breakdown of well types for those permits issued in August 2016 included 203 oil, 24 gas, 392 oil or gas, 26 injection, zero service and 15 other permits. Also in August 2016, the RRC processed 545 oil, 223 gas, 46 injection and 8 other completions, compared to 1,113 oil, 172 gas, 36 injection and 11 other completions in August 2015. Total well completions for the 2016 year-to-date are 8,107, down from 14,665 recorded during the same period in 2015. According to Baker Hughes Inc., the Texas rig count as of September 9 was 245, representing about 48 percent of all active rigs in the U.S.
For additional drilling permit and completion statistics, visit the Commission’s website. OSHA recently issued new guidelines for approving settlements between employers and employees in whistleblower cases to ensure that they do not contain terms that could be interpreted to restrict future whistleblowing. The new guidelines respond to a March 2015 petition for rulemaking from the Government Accountability Project, which asked OSHA to clarify that it will not approve settlements that discourage whistleblowing. In particular, the updated guidelines make clear that OSHA will not approve a settlement that contains a provision that restricts the employee’s right to provide information to the government or requires the employee to notify the employer before or after communicating with the government. OSHA also will not approve an agreement that requires a whistleblower to waive his or her right to receive a monetary award from a government-administered whistleblower program or to pay the employer a portion of such an award. More information can be found via OSHA’s website. The Occupational Safety and Health Administration (OSHA) and Health Canada, through the Regulatory Cooperation Council, have jointly developed a 2016-2017 Workplace Chemicals Work Plan. The purpose of the work plan is to ensure that current and future requirements for classifying and communicating the hazards of workplace chemicals will be acceptable in the U.S. and Canada without reducing worker safety. OSHA signed a Memorandum of Understanding with Canada’s Department of Health in 2013. The goal of the MOU is to devise a system, accepted by both countries, that allows the use of one label and one safety data sheet. OSHA aligned its Hazard Communication Standard with the GHS in March 2012 to provide a common, understandable approach to classifying chemicals and communicating hazard information on labels and safety data sheets. OSHA’s Hazard Communication Web page includes links to the standard, frequently asked questions and guidance materials. Weatherford Drilling Int’l: Rig 144 (15); Rig 147 (4); Rig 150 (3); Rig 155 (17); Rig 811 (5); Rig 875 (2); Rig 891 (2); Rig 892 (2); Rig 893 (2); Algeria Support Team (1); Kuwait Support Team (1). Weatherford Drilling Int’l: Rig 147 (4); Rig 808 (1); Rig 811 (1); Rig 841 (1); Rig 844 (2); Rig 875 (1); Rig 892 (2); Algeria Support Team (1); Egypt Support Team (1); Kuwait Support Team (1).